Antiepileptic Drugs (AEDs) are also called as anti-seizure drugs because they provide symptomatic treatment only and have not been demonstrated to alter the course of epilepsy. AEDs have been found to decrease the frequency or the severity of seizures in people with epilepsy. The ideal AED is expected to maximize quality of life by minimizing seizures and adverse drug effects. According to WHO, there are approximately 50 Million people worldwide suffering from epilepsy, accounting for 0.6% of the global burden of disease. Seizures are defined as the clinical manifestation of an abnormal, disorderly discharge of the brain's nerve cells, resulting in a temporary disturbance of motor, sensory, or mental function and a tendency to have recurrent seizures is called epilepsy. Global antiepileptic drugs (AEDs) market is expected to flourish at a CAGR of 3.5% over the forecast period i.e. 2017-2027. Further, the market of AEDs is expected to reach USD 5.3 Billion by the end of 2027. 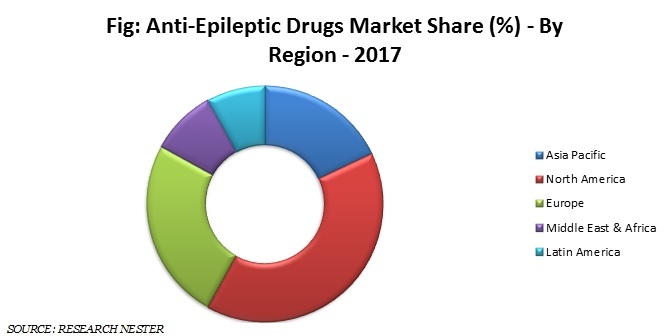 Geographically Asia Pacific market is expected to grow at the highest CAGR due to rising awareness regarding preventive treatment for epilepsy in emerging economies such as China and India. Further among all Asia’s countries China has largest market share in the regional platform and is expected to continue its dominance over the forecast period. Increasing disease prevalence in these regions is expected to result in an increased demand for AEDs. Further, North America AEDs market is expected to grow at a substantial rate over the forecast period. Further, factors such as increased healthcare expenditure to mitigate the rising disease prevalence are expected to be the dynamic factor for the growth of AEDs market in this region. It has been observed that over the years there has been an increasing incidence of generalized and partial epileptic seizures globally. This is contributing to the global disease burden due to which there have been an increasing number of pharmaceutical companies investing their resources towards developing more effective anti-epileptic drugs to improve the quality of live, minimize the incidence and to reduce the adverse effects. Also, the increasing healthcare expenditures by government bodies, growing awareness among people towards advanced treatments along with the increasing popularity of personalized medicine is expected to positively move the market for anti-epileptic drugs globally. However, the increasing cost associated constraints along with limited accessibility in low and middle income countries resulting in a treatment gap is expected to hamper the market growth.